Located on the 61st floor of Banyan Tree in Bangkok, Thailand, Moon Bar has gone through an extensive remodel for 2019. The owners have changed the side of the roof that the bar sits on so patrons can take in a full 360 degree view of the city. A highlight of the remodel includes a reinforced glass balcony dubbed the “Moonwalk” which is perfect for photo opportunities. Along with the venue remodel, there have also been changes to the cocktail menu. The Bird of Paradise and Vertigo Sunset, are both rum based and well reviewed. The MoonBar is situated on the 61st floor of the Banyan Tree Bangkok Hotel and has recently gone through much transformation to kick off 2019. 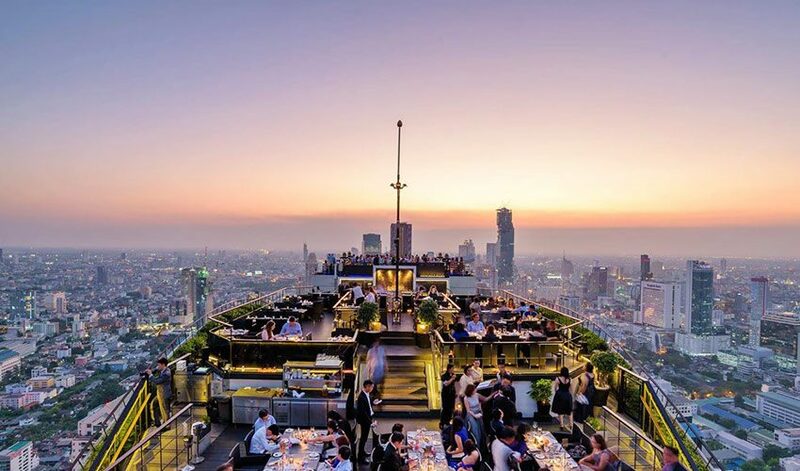 By completely swapping sides off their rooftop, the MoonBar gives bargoers a 360 degrees uninterrupted view of the city and is now a prime spot over Bangkok city life. The author states that he first arrived at the MoonBar when it was opening at 5pm on a Friday and recommends getting there early for a choice spot. Also, check out the luxurious rooms at the Banyan Tree Bangkok. This entry was posted on Wednesday, March 20th, 2019 at 2:23 pm and is filed under News. You can follow any responses to this entry through the RSS 2.0 feed. You can leave a response, or trackback from your own site.